On Wednesday the 22nd of February 2012 I attended a public “triangle” meeting held in St Luke’s Church, Arbury, Cambridge. The three sides of the “triangle”, made up of the management of the hostel at 222 Victoria Road, the police, and councillors, met in public, with local residents. As well as just discussing 222 Victoria Road, this particular meeting, also covered wider policing items, and also a few local planning matters. The hostel is to be closed for refurbishment from September 2012 until August 2013. No provision is to be made for replacing the bed spaces elsewhere in the city during the closure. When I asked about the impact on staff, the management appeared unconcerned about losing experienced staff while the premises are shut, despite the lack of experienced staff being blamed for problems in the hostel in the recent past. The long term reduction in bed spaces at 222 Victoria Road will be accompanied by fewer bed spaces being provided at other hostels in the city. Residents at the meeting expressed concern about this given the current provision is oversubscribed. Councillors shrugged their shoulders and avoided the question, letting Cambridge City Council officer David Greening respond. Mr Greening said fewer bed spaces would be needed in the future as individuals’ average stays in hostels would be reduced due to more effective interventions. Members of the public expressed a concern I share, that this is wishful thinking. We were told the refurbishments are to be 50% funded directly by the taxpayer through central government, with the other half put up by the English Churches Housing Group (ECHG) who run the hostel. ECHG reported they intend to “respond to residents’ concerns” by spending money on “adding colour” (via green panels) to the front of the building. They told the meeting they are so concerned with aesthetics they’re even moving a window to give the building a more symmetrical appearance. My view is this is a shocking misdirection of funds which could be spent helping the homeless and those with drug and alcohol problems. A member of the public suggested plants; planters in the front, hanging baskets and window boxes. The meeting had been advertised by Labour Party flyers posted through letter boxes in the area, and Labour Cllr Carina O’Reilly chaired proceedings. The police had also advertised the meeting via their ECops system, however one said 19.30 and the other 20.00. This resulted in about half the public attendees turning up well before the meeting got underway. Arbury’s Liberal Democrat Councillor Tim Ward had sent his apologies. Prior to the meeting starting Cllr O’Reilly approached me to tell me that Kevin Scanlon, ECHG’s regional manager, with responsibility for 222 Victoria Road and Cambridge’s Willow Walk hostel, had asked not to be photographed. I had not done anything to suggest I might photograph him, and I asked Cllr O’Reilly why she was only telling me this, she responded to say she thought I was the only person who might want to take photos. A Cambridge News reporter spoke up to say he might have wanted to take photos too. Both of us agreed not to take any photos of the camera shy Mr Scanlon during the meeting. Mr Scanlon was accompanied by two colleagues, one responsible operationally for the 222 Victoria Road hostel, and the other the project manager for the refurbishment. A short presentation was given. 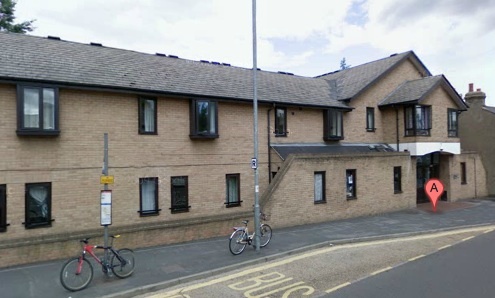 We were told the central government grant for the refurbishment had been approved; but that ECHG were waiting for the outcome of a Cambridgeshire County Council decision due in April 2012 on the future revenue funding of the hostel. Mr Scanlon explained his organisation didn’t want to spend large sums on refurbishing a hostel it would be left with no funds to run. Mr Scanlon told the meeting that the changes had been prompted by Cambridge City Council who had asked ECHG to make changes to the service they provide. The main changes involve separating the hostel into separate areas for those with different needs (we were told there are two three bed houses on the site for the use of those almost ready to leave). The refurbished hostel will also contain three emergency rooms which can be allocated by Cambridge City Council officers. The meeting was told how the top floor would be used by those who had beaten their addictions, whereas the lower floors would be used by those still drinking. A member of the public questioned the rationale of having such people in close proximity; the response from Mr Scanlon was that the separation would be better than in the past, and this was one of the key aims of the project. There was scepticism from those sitting near me over if the separation was sufficient. Having read accounts of those who’ve spent time in the hostel it’s clearly important that those who want to get away from drugs and alcohol are given the opportunity to do so; I’m not convinced the proposals will achieve this. Another feature proposed are areas, open to the public, and separate from the residential parts of the centre, including a computer room, meeting room, and gym. Questioned on where the tenants would go during the refurbishment, or in the longer term what the impact of the reduced number of rooms would be, Mr Scanlon, for ECHG, said “I don’t know”. Councillors also didn’t answer the question, even though it was directed specifically at them. City Council officer David Greening was invited to comment and confirmed bedspaces were also planned to be lost at Jimmy’s and elsewhere in the city. He said that in the past people had been spending years in hostels, but now the hostels were much better at helping people to move on so there was less need for them. However countering his own point, he agreed the current provision was oversubscribed. Mr Greening pointed out that only those with a link to Cambridge were able to access the city’s longer term hostels, and other homeless people were encouraged to leave the city, he gave this as another reason the city could cope with fewer beds for those who would otherwise be homeless and perhaps living on the streets. Talking about the revenue funding for the ongoing running of the refurbished hostel Mr Scanlon told the meeting ECHG was making a bid to Cambridgeshire County Council to keep staff levels at the centre the same despite the plan for them to be dealing with fewer residents. The aim is to provide more intensive help and treatment. We were told that the number of individuals from the “current client group” would be reduced from 74 to 30 (and ~20 further individuals, with lesser needs, would also be accommodated). Mr Scanlon appeared to not be too keen on the idea of shrubs, rather than green panels, to improve the appearance of the building, saying he was concerned about the costs. We were told that railings would be put up to prevent people sitting on the low wall in front of the building. A number of people asked about the expected impact on groups of people from the hostel drinking in the area and causing problems (such as arguing and fighting in the streets). The response was simply that the numbers of such people ought be reduced, and a consequent reduction in the problems might be expected. Mr Scanlon said that those with chronic alcohol problems were accommodated at Willow Walk, and those at 222 are those who are prepared to make an effort to tackle their problems. Mr Scanlon and his colleagues left immediately after their short presentation and questions. They didn’t wait for the police, and other sections of the meeting. The police sent two PCSOs, Clare Jolly and Luke Upcott. Only PCSO Jolly spoke. PCSO Jolly told the meeting that the police attended the 222 Victoria Road hostel on a daily basis. A very odd, content-less, recount of recent major events in the area was given, but without any details, those present being assumed to be aware of them. They were, the death of the man found in the church foyer, the incident of the woman who fell from Kingsway flats, and bizarrely “a man arrested for driving a car”. The discussion then turned to other policing matters. A resident complained about people driving on the pavement on Histon Road; PCSO Jolly said this had not been reported to them before, and suggested the resident report it, including “index numbers” of cars via Ecops. (I suspect this was an attempt to prevent incidents being recorded, as I have on a number of occasions confirmed that incidents reported via ECops are not routinely formally recorded). A resident complained that she had tried to report criminal damage done to vehicles, but the police had refused to accept her report on the grounds she didn’t own the vehicles in question. PCSO Jolly confirmed the refusal was in line with police policy; this didn’t go down well at all with those present. PCSO Jolly was asked if the police would accept a report of a burglary from a neighbour who’d been asked to look after a home while the owner was away. PSCO Jolly said that while the police might respond to a call from a neighbour if it was thought the burglars were on the premises, but otherwise they would want to hear from the owner of the property before taking action. I hope, and presume, that PCSO Jolly was just out of her depth and talking nonsense. I think great damage to the perception of the police was done by the presentation and the North Cambridge Neighbourhood Policing Sergeant, Sgt. Wragg, should probably seek to make a statement in the follow-up note which was promised to be circulated after the meeting to clarify the police position. A resident asked what the items on poles outside 222 Victoria Road were. It was confirmed they were Cambridge City Council owned and run CCTV – the fact residents are not aware of this shows they need to be better signed – this is something I have been lobbying for for many years now. PSCO Jolly expressed her support for the City Council’s deployment covert cameras, saying they were more effective at catching people. (I support the use of covert techniques in appropriate circumstances too, but the City Council has no mandate for covert deployment in this manner, and denies this is what its operations amount to). A brief discussion of local, Arbury, planning matters was chaired by Cllr Todd-Jones. The discussion started with the application from Trinity College to house 40 Graduate Students in the ex NHS property, Wessex Place. The main concern raised by local residents was parking. A number complained about students using the on-street residents parking bays in the evenings (when the bays are not in operation), some were concerned about parking in near-by uncontrolled streets. I thought the anti-student tone of a number of the contributions was horrible. Such venom against any other sectors of society would not be tolerated, but it appears students, even graduate students, are considered fair-game for attacks in Cambridge. I don’t think the fact the residents will be graduate students is relevant at all; and personally I’d suggest that a practical and realistic approach ought be taken and a handful of parking spaces provided for on the site. If there are trainee teachers living there travelling well out of Cambridge on placements, why deny them a place to park, or trainee doctors, places all over the region, or those working in other fields with a need for a car. One concern raised was that councillors may have been misled, and the impression given to them that resident students would need permission from the Motor Proctor to keep cars. Understandably given the complexity of the university’s rules (which can be gold-plated by the colleges), there were differing interpretations of what they actually are from residents present. Students with “MA Status” don’t need to apply for a licence, is my interpretation of (S.3(d)) though in Cambridge there is often a huge gulf between what the rules say and how they interpreted in practice. The decision of councillors to reject this development has been overruled by an unelected planning inspector. A number of residents complained about the lack of democracy in the planning appeals system. A number of residents made comments which would have been better made earlier in the process, but Cllr Todd-Jones reported many of them had in fact been put forward by him and others at the appropriate point. This hostel is more worrying as it is not run by any academic institution. One resident questioned why student halls were being built, not family homes. I wasn’t there to answer questions, but have heard two points made, one is the argument moving students into dedicated accommodation might free up houses for others; resulting in both families and students ending up in more suitable accommodation. Another aspect is economics; student halls provide investors an excellent return on their money, and are continuing to do so even in the current economic environment. Cllr O’Reilly suggested the main driver was the universities, ARU and the University of Cambridge, both seeking to accommodate all of their students, which neither was able to do at the moment. Cllr Todd-Jones reported this application had been withdrawn. Residents of Alpha Road asked about another property where someone was living in a converted shed. (This is getting increasingly common in Cambridge). Cllr Todd-Jones said he was awaiting advice from the council’s planning officers about this kind of arrangement, and what, if any permission would be required. On the subject of the same property one person present complained they lived near enough to hear the noise from a HMO but were outside the consultation area for notifications of planning applications. (This is a point I’ve made in the past, relating to licensing, and the council’s response has been they’re very concerned about only notifying those they have to by law, out of fear any other action could be interpreted as improper; councillors pathetically accepted this explanation). One resident said she’d like to see a family friendly pub offering good food; but didn’t appear to be actually proposing to invest in and run such a business in the premises. Cllr O’Reilly said she had visited the property with someone who was considering running it as a pub, but he would have wanted to create and sell off some flats to fund it, and the risk the city council might not permit that was too great for him to take. Liberal Democrat campaigner Alan Levy said there was no point in the planning system designating pubs as community facilities and keeping the buildings there if no one was going to run them as a successful business. Residents lamented the fact the fate of the building appears to depend on the unelected planning inspector from Bristol, rather than local councillors. Cllr Todd-Jones kept quiet about the fact he doesn’t vote on planning matters. Proposals for the Future of the Hostel at 222 Victoria Road – details released via my FOI request. This entry was tagged Arbury, Police on February 23, 2012 by Richard Taylor. If the hostel is to be closed from September 2012 until August 2013 what happens to current staff? Are they made redundant? That will explain why no permanent contracts have been issued for some time and they are mainly operating with agency staff. What happens to the vulnerable residents during this closure? Are they being decanted to other projects or are they simply asked to leave and put out on the street? If they are just sent out to the street expect to be reading of more homeless deaths in Cambridge especially in winter. Lack of experienced staff in the hostel being blamed for problems is a disgusting comment considering they are operating a rule of not employing any permanent staff and the induction and support of staff has been historically very poor. It does seem pretty clear what the intention is when reducing bed space across the city and I think its commonly known as ‘ethnic cleansing’. The homeless are very much a community that is about to be dispersed NIMBY style with Mr Greening confirming that with reducing bed space and relocating those without a Cambridge connection. ECHG concerns with aesthetics of the property and misuse of funds. CLG funding would be specific to property refurbishment so they couldn’t spend it on additional support staff. Cambridge County Council funding decision due April 2012 will be Supporting People Funding. This is the funding used to help people back into society. If this is pulled or reduced they could be solely reliant on rental income with another provider delivering the support contract. Circle have been gaining large amounts of contracts recently. Question is, can they go to private providers like SERCO or G4S? Separating the hostel into needs is unworkable as there will always be pressure to fill voids (empty rooms) and reduce the loss in revenue. For example, if there is a ‘dry’ section that has 3 rooms empty for a number of weeks, that is a large loss in income which the landlord will not want to bear. Unless Gov’t are willing to cover void loss to maintain the system? Areas open to the public such as gym I am assuming are going to be ‘social enterprise’ based and income generating. I doubt they will be providing gym access for free? Housing associations really should be subject to FOI to make them more accountable and transparent. Excellent quality of work Richard. Keep it up. Would dearly love to see video recordings of these and other meetings. Thanks for that informed comment. I’d love to as well. I’ve got the kit, and I’m willing to use it. However as seen with Kevin Scanlon at this meeting, many in responsible positions like to operate in the shadows. Even more formal meetings, such as City Council’s formal meetings, have such restrictive filming rules that no-one is able to film. I agree the central government funding will be ring-fenced for infrastructure; but I still don’t think changing the colour of the building is appropriate. I think the building as it is fits into the streetscape quite well; it’s the behaviour of some of the residents and their visitors that’s a problem, not the aesthetics. I checked and it is City Council CCTV outside the hostel. I’ve been campaigning for years to have the city council’s CCTV better signed. The residents not knowing whose it was shows this is needed. This states the refurbishment will be done in two phases, with some residents on-site throughout. It is quite rare for Cllr Todd-Jones to speak on a planning item. There is a discussion of the validity and reasonableness of Cllr Todd-Jones’ position on the article containing his statement. During the full council meeting on the 23rd of February Cllr O’Reilly pointed out Cllr Ward’s failure to attend the meeting and said that Cllr Ward had chosen to “go to dinner” instead. It has been reported that the planning committee has given permission for Wessex Place to be used for student housing. Cllr Hipkin is incorrect in relation to many graduate students, and it is graduate students the college is proposing to house on the site. While overall I support the approval; I think it is disappointing that despite efforts of local residents and our elected representatives it appears the accurate information was not in the hands of those making the decision. Personally I’d like to see parking on the site, making it a practical place for those graduate students who have a legitimate (eg. trainee doctors and teachers on placements out of Cambridge) need for a car to live. My interpretation of the position on students and cars was rhetorical and evinced the officer’s confirmation of that interpretation. If your information is correct I shall take it up with the officer concerned. The link to Cambridge University’s rules is in the comment above, so I don’t know what more I can do to demonstrate to Cllr Hipkin that what I am saying is correct. They generally simply point to the University’s rules; the only extra rules relate to taking vehicles into the college’s main sites for loading/unloading. Cllr Hipkin has written to the planning officer, copying me, in his message he suggests he was under the impression the hostel would be occupied solely by undergraduate students and hence cars would not be permitted. Looking through the application materials there it appears the permission sought is for students in general (as would be expected) this would include graduate students. car and this extends to both undergraduates and postgraduates. occupants cannot be issued with visitor permits either. student residents to have a car while living at the premises. Students as a matter of course are not allowed to have cars under the Colleges domestic rules and leasing arrangements without specific dispensation by the Bursar. An extract from the proposed lease clause is attached. … The rules do not allow students to have their own vehicles at the College or the domestic accommodation. This document was prepared R E Seaman for Bidwells LLP on behalf of the college. The proposed extract from the proposed “lease clause” is not as far as I can see on the planning file. The college’s rules, as linked above, make no such restriction, and the college’s accommodation handbook makes no mention of motor vehicles. The only element of the “terms and conditions” I think I’m missing is the licence agreement used by the college, so I’ve made a Freedom of Information Request for what the college calls its “Licence to Occupy”. It would be a very confusing situation for the students if the college rules were superseded by their licence agreements, especially as the rules on motor vehicles don’t point students to their licence agreements. I often complain about developers and dodgy landlords running rings round and outsmarting our councillors; if it turns out the college has been misrepresenting its rules then I’ll have to add them to my list. All residential property, including both flats and individual rooms in graduate hostels, not forming part of the College itself is managed for Trinity College by Bidwells, and let by them on behalf of the College on Assured Shorthold Tenancies, not Licences to Occupy. Student rooms are let via a “Licence to Occupy” in accordance with the Code of Practice. My view is that Trinity College are failing to make clear in their accommodation handbook, the published information they make available to prospective tenants, the contractual terms which will be offered. They say it will be a licence whereas my FOI response indicates than in the case of property “not forming part of the College itself” a shorthold tenancy is offered. This appears to me to be a breach of the ANUK code. There are pros and cons of a licence vs a shorthold tenancy, but in my view the college ought be clear to its staff, students and others it might rent property to about what they ought expect. I think it is important this information is made available in advance of moving in and being presented with a contract to sign. “To park private vehicle(s) only at the Premises”. or it could mean that vehicles must only be parked at the premises as opposed to elsewhere. In my view “at the premises” notably does not say “on the premises” and therefore presumably includes the public roads in the vicinity. The clause is in my view unclear, a Google search suggests this is a standard line present in many tenancy agreements for blocks of flats and similar but I cannot find any reference to cases where attempts have been made to interpret it. Specifically I consider the college to be in breach of paragraph 3.2 of the code which states. Assured Shorthold Tenancies , not Licences to Occupy. I believe the information made available by the college ought make clear that Assured Shorthold Tenancies are used by the college in relation to some of its properties and that samples of standard licences and tenancy documents ought be proactively published by the college. Should the college be renting flats and rooms in hostels, not forming part of the College itself outside of the ANUK Code of Practice I think that too (alternatively) ought be made clear in the material published by the college. I am writing to the college as raising the matter with the establishment is the first step of the complaints procedure associated with the ANUK Code of Practice. I have copied Cambridge City Council’s executive councillor for housing, Cllr Smart, as should the college cease to be eligible for the exemption from regulation signing up to the ANUK Code of Practice provides I hope she and her officers will be ready to step up. Trinity College have responded to say there is a further handbook, not published on their website, which applies to the off-site hostels. The contract for those renting rooms in these hostels has already been released. I am responding to your e-mail below, as the Responsible College Officer charged with oversight of the College’s accommodation. The Accommodation Handbook to which you refer, which is publicly available on the College website, deals with the occupation of accommodation within the College. It is College policy that all unaccompanied students (undergraduate and postgraduate) new to Trinity are offered accommodation within the College itself for their first year at the College. It is therefore immediately relevant for those considering applying to the College. Prospective occupants of College-owned graduate hostels will already be students at the College. There is a separate handbook, produced by Bidwells in consultation with the College, covering occupation of properties owned by the College but managed by Bidwells. The College does not therefore share your assumption that the College Accommodation Handbook published on the website is the main source of information available to prospective tenants of graduate hostels. In regard to the registration of the College with ANUK, the College’s registration included the graduate hostels, and gave details to ANUK of the different arrangements applying to them. I hope that this explains the position, but am grateful to you for drawing to the College’s attention the potential for misunderstanding. The accommodation sub-section in the graduate section of the website could be clearer that the Accommodation Handbook refers only to accommodation in College of new graduates in their first year at the College. We shall amend this section of the website. As you have copied your e-mail to Councillor Smart, I do likewise. I have made a FOI request, in public for this second, separate handbook, the existence of which has been revealed via this correspondence. Cllr Hipkin has written to me to say he’s going to continue to pursue this, on the grounds that it’s really important that the planning committee get accurate information to make decisions on. I am a resident living in bermuda terrace for the last nine years. For the last 9 months or so, residents in the area have enjoyed a pleasant place to live. The carpenters arms has now been closed and awaiting redeveloment. I welcome new flats to be built on it’s site. The pub has been nothing but trouble. Very loud music and the beer garden allowing patrons to drink until the early hours is a disgrace. Only residents living nearby such as myself, realise the mistake of having a pub so near private houses. Trinity College have now released their handbook for off-site properties managed by Bidwells. I think I have now exhaustively demonstrated this is not the case. that I had been given by the applicant and agent. on on-street parking in the area. The council officer’s argument appears to be that the planning committee wasn’t misinformed as it was only told what the college told the council. The council officer appears to have failed to consider that what the college told the council isn’t necessarily the truth. I understand the council officer didn’t intend to mislead the committee based on the information available, but that doesn’t mean the committee was not misled. If the committee was told that it was only the word of the college, the applicant, that residents would not be permitted to have cars, perhaps councillors on the committee should have been expected to be wary about considering that a reliable source of information. However if officers reported it to councillors as a fact, then councillors might have reasonably believed their officers had checked it. The section of the officer’s response on parking permits is utterly irrelevant. Thanks for another in-depth account of what’s going on in Cambridge. As a former drugs-worker my first anxiety was that ECHG plan to house people who are no longer misusing substances on the top floor of the ECHG. 222 has tried that before – I think they called it the red wing – and it was an abject failure. They need to house people who are recovering in a separate building: I wonder if they could re-assign in the future Willow Walk as their house for people no longer using? I will be sad that beds will be lost from 222. But the other side of this is that former members of the street economy have identified the relatively liberal treatment of homeless people in Cambridge as something that pulls homeless people in from outside, not least London; a Council survey of homelessness in Cambridge in the early part of the last decade came to similar conclusions. Councillors, and their officers, appear to have learned from the Wessex place debacle and are now making a better effort to ensure they are properly informed about car parking arrangements when it comes to planning applications by Cambridge University and its colleges. When, on the 5th of September 2013 , the West Central Area Committee considered an application for development at Owlstone Croft in Newnham (Queens’ College graduate accommodation) they asked detailed questions about the use of cars by graduate students and the planning officer was well prepared on this point and read out a comprehensive statement explaining the university’s and college’s rules and how they were enforced. The officer explained how those over 24 didn’t need permission from the university, and gave examples of circumstances in which those under 24 would be offered permission. Cllr Hipkin also noted that a university or college rule wasn’t a legal restriction. I felt in light of this detailed information councillors were better placed to determine the application (which related to plans for a nursery on the site; though parking and traffic were a key consideration). The greater accuracy will lead to councillors making better informed decisions about the future of Cambridge.